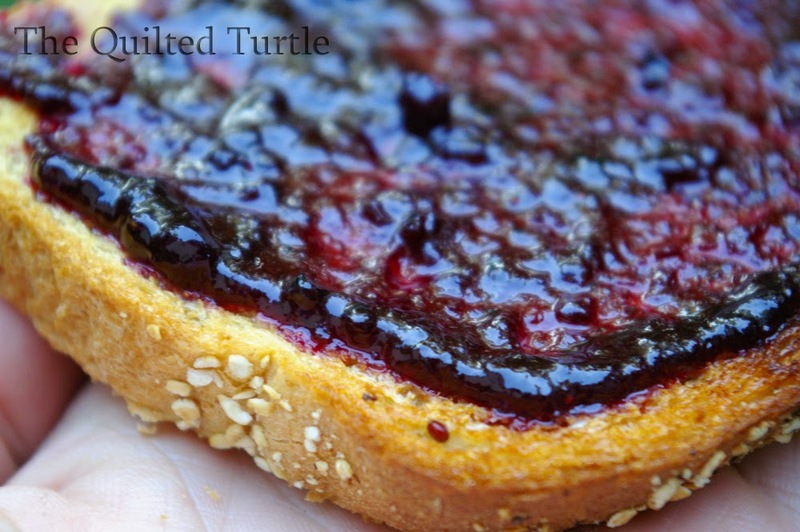 The Quilted Turtle: All I Can Say is, "Yum"
All I Can Say is, "Yum"
Allen took the kids and I on a wonderful camping trip recently in the Upper Peninsula, near Manistique. 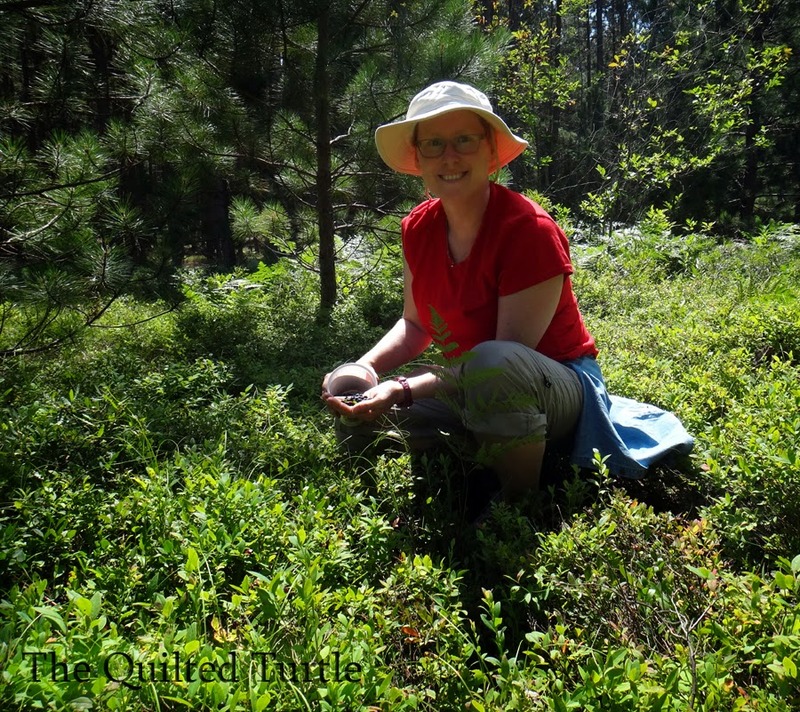 The campsite, the only one on the lake, was lovely and quiet, but, for me, the best part of the weekend was the wild blueberries growing near by. With a bit of help I managed to bring home 12 lb 9 oz (just under 6 kg) of deliciously sweet berries. I'd never made jam before (just apple butter,) but wild blueberry jam seemed like a good place to start. I used this recipe. There's a ton of information to sort through on the page, but as a beginner I really appreciated all of her experience. I crushed, cooked, poured and processed three batches and ended up with 36 eight-ounce jars - just over two gallons of jam! (about 8.5 liters.) And I still have most of a gallon-size zip-lock bag of berries in the freezer. It was yummy. So much so, that we are heading up to Paradise next week to see if we can pick more. Allen even surprised me with a blueberry rake. I think he's hoping that we'll stock the pantry with blueberry syrup and pie filling, and fill the freezer with berries to enjoy all winter. 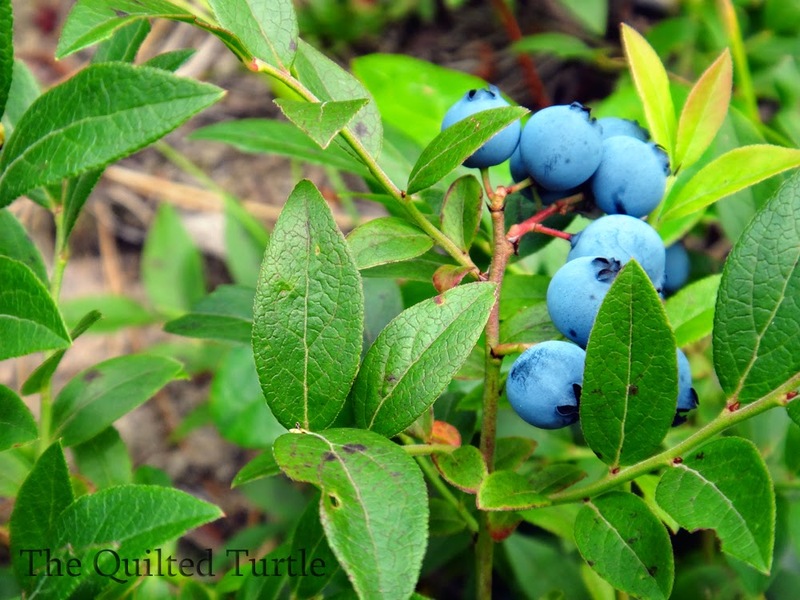 So, if you know of any good blueberry recipes, please send them my way! 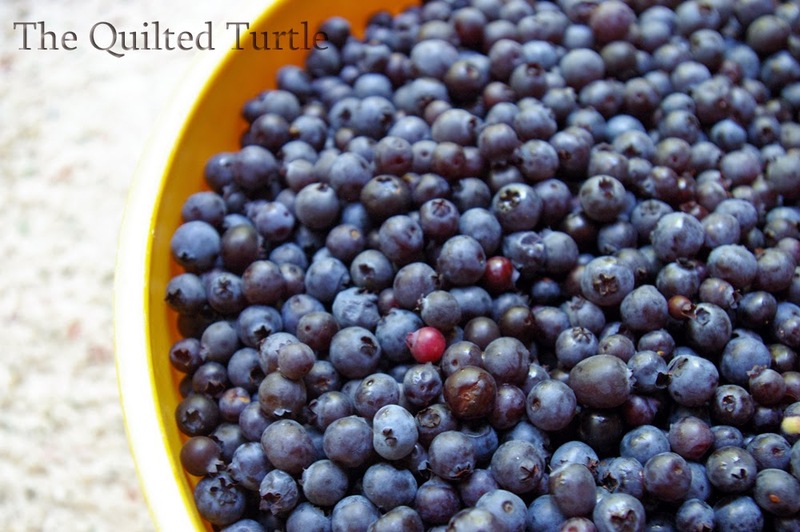 I've picked about 25lbs of blueberries so far this year, but doing anything with them other than freezing them is considered nothing short of sacrilegious by the 14-year-old berry fiend. So freezer full it is! Wild and free would be good in my books, but they are hard to find wild in any great quantity around here. In pie pan or pie dish, bake bottom crust in a 400 degree oven, on bottom shelf, for 10 minutes or until browned. 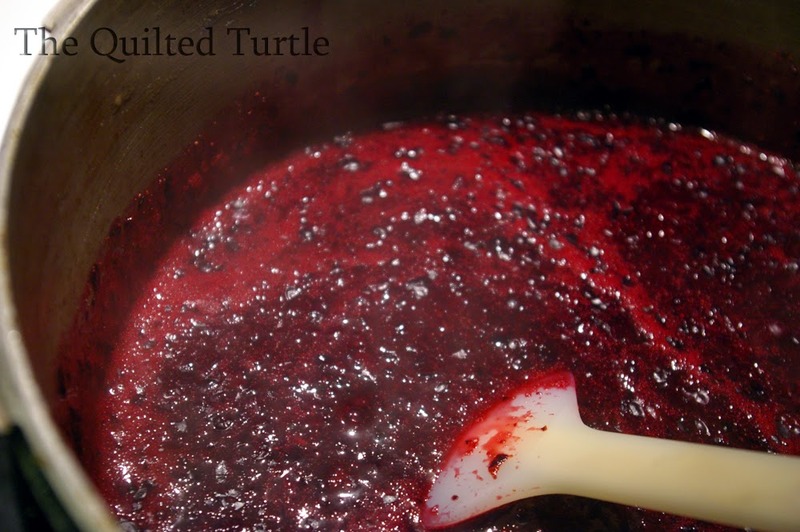 Pour 1 ½ cups washed and well drained berries into pie shell. In a 2 quart saucepan, melt butter. Add and combine flour, lemon juice, sugar, vanilla flavoring, optional almond flavoring and cinnamon. Stir in 2 ½ cups washed berries. DO NOT ADD ANY MORE LIQUID! 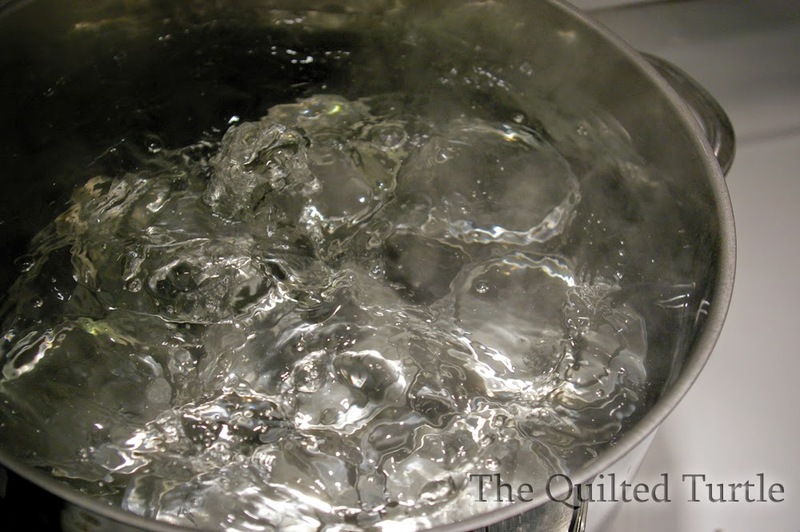 Over LOW heat, bring just to a boil. Berries should begin to pop open. Pour cooked berry mixture over fresh berries in pie shell. If not using top crust, refrigerate pie until cool. This will help pie hold together and not be runny. If using top crust, bake in a 400 degree oven for 15 minutes or until golden brown. Oh my goodness! All those wonderful sweet blueberries! Lucky you! Here's a favorite muffin recipe of mine that I shared on my blog. It calls for raspberries, but I've made it with blueberries as well! Enjoy! The mayo in the crisp sounds weird, but it's actually very good. For some reason, it makes a nicer texture than using butter.